Raaga.com: Is Sanjay Leela Bhansali once again taking ‘Panga’ with Shah Rukh Khan? Is Sanjay Leela Bhansali once again taking ‘Panga’ with Shah Rukh Khan? 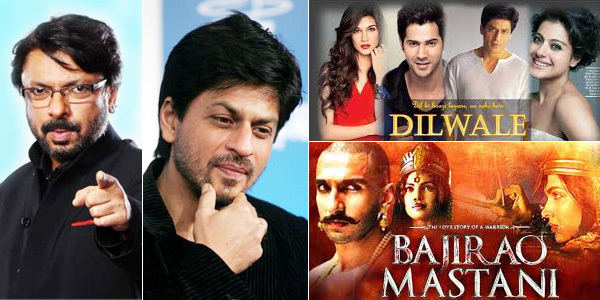 After 8 years once again two biggest names in Bollywood are set to clash at the box office. No prizes for guessing. Yes it’s yet again Shah Rukh Khan and Sanjay Leela Bhansali whose films DILWALE and BAJIRAO MASTANI would be releasing this Diwali. What is surprising is that Bansali who lost the battle in 2007 when his film SAAWARIYA, which introduced Ranbir Kapoor and Sonam Kapoor's bit the dust opposite Shah Rukh’s OM SHANTI OM must have shown maturity and shrugged off his ego. Instead of once again clashing with SRK he should have delayed his movie either one week after DILWALE or released one week prior to it and avoided the unnecessary clash because the fact is Shah Rukh Khan is the undisputed King of Bollywood and has a mass appeal. Further DILWALE has many more positives that could give Bansali a run for money. For instance DILWALE brings the magnetic Jodi of Shah Rukh Khan and Kajol after many years hence cine buff would definitely rush to watch the irresistible jodi’s screen persona. To add cherry on the cake, the movie has already generated much curiosity among viewers about Shah Rukh Khan and Kajol recreating the DDLJ pose and paying ode to the 20 year journey of the film. Secondly the movie has young heartthrob Varun Dhawan and HEROPANTI fame Kirti Sanon, which is sure to attract the youth. And last but not the least the movie is directed by Rohit Shetty and since 2008 Shetty is enjoying an unbeatable track record of success. In nut shell Sanjay Leela Bhansali is yet again taking ‘Panga’ (Conflict) with Shah Rukh Khan and in all probability ruining the bright prospective of his upcoming film BAJIRAO MASTANI! Hope sense prevail and Bhansali shifts his movie’s release date because as the proverb goes ‘Better late than never’!! !